Aalto is a new semi-modular software synthesizer with an innovative, patchable UI, distinctive sounds, and a charming personality. 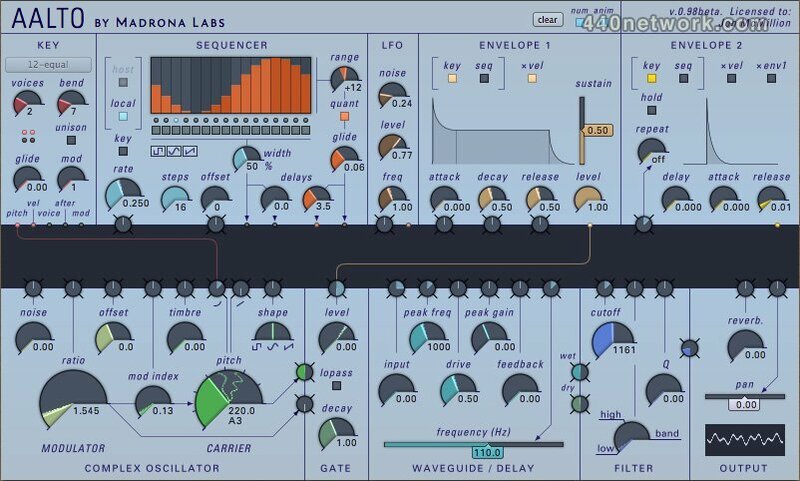 Aalto's sound engine lets you create sounds that have been difficult or impossible to make with softsynths before now. The heart of Aalto is a Buchla-inspired complex oscillator, with FM, timbre and waveshape controls that enable a wide range of expressive sounds. These sounds are uniquely malleable and alive, in part because they are made with dynamic calculation, not static wavetables. Aalto is designed as much for sequencing patterns as for playing individual notes. Each voice has a separate, built-in sequencer with a patchable, independently controllable rate and offset that make it easy to achieve evolving, chaotic textures. Following the lowpass gate is a patchable waveguide / delay module with a waveshaper and a peaking EQ built into the feedback loop. Because it has such short and controllable delay times, unlike a typical analog delay, it can be used as an additional oscillator or waveguide. Subjectively speaking, Aalto can make a wide range of sounds, from lush to edgy, including some very complicated ones, without sounding too thick in a mix. Aalto's sounds are not hyped or confined, they are wide-range, open and natural. We hope our approach will appeal to experienced sound designers who have their own favorite EQs and limiters. And for those just getting into synthesis, Aalto is an accurate and honest tool for learning. We have tried to make Aalto a deep instrument that will reward lasting engagement. .1 update of all three plugins to address some things that were broken in the recent extensive updates. With version 1.7 of Aalto, our favorite West Coast softsynth now adds MPE support, and other improvements. Many smart and experienced people, including all us makers of new and ambitious controllers, looked over a draft of this spec and contributed changes. MPE makes sense, is easy to implement, and should be very useful. With its addition Aalto becomes one of a just a few great sound makers out there for per-note expression. I am hotly anticipating more Linnstrument+Aalto, Seaboard+Aalto sounds. Soundplane owners have always had a great connection to Aalto over OSC. But the big deal for the Soundplane is that now, while we are still waiting for the OSC-based composition environment of our dreams, we can use ordinary DAWs to record and edit an entire Soundplane performance. Aalto version 1.7 also brings improved Soundplane compatibility with MIDI patches, optimized animation drawing, and bug fixes. MPE support in Kaivo synthesizer will follow next month with other changes. sequencer now quantizes to currently selected musical scale. on Save as... outside normal patch directory, warn then allow anyway. Fixed an issue that was slowing down Aalto dramatically on some Windows systems. Fixed an issue requiring a runtime support pack on some Windows systems. Improved latency through the patcher when running at large host buffer sizes. Aalto now draws at full resolution on Macintosh Retina Display, in compatible hosts. Aalto is now compatible with Soundplane version 1.0 and higher. Fix mousewheel direction on Mac OS 10.7 and higher. Accelerated drawing to the screen on Mac OS with OpenGL. Optimized drawing scheduling to avoid glitches, especially in Logic. User and factory presets now share the same location. Improved ergonomics of patcher with larger handles and smoother graphics. Fixed a drawing problem with bipolar dials. Improved drag ergonomics for dials. This fixes the Logic validation problem some people were seeing on Mac OS 10.8. Over 100 new presets from Richard Devine, Rory Dow, Surachai, Edward Ten Eyck and Madrona Labs. Sound-controlled synthesis and effects. 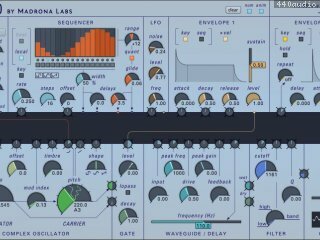 Virta is a patchable toolbox for turning your voice or other instrument into wild new synth sounds.